Am I talking about something that is done is secret to which only the most privileged are privy? While the history of global politics and global banking has always been based on secret meetings, those who've read about the government's extensive intervention, at critical points in our markets – usually occurring at the rule-making level – are well aware of the manipulation about which I write. Since the credit crisis became public knowledge to those who follow the financial news, we have seen four market bottoms. We only need to look at recent history to see the merits of our previously stated hypothesis. If I am correct, then we must set aside the tired assumptions of the market's “random walk” or “the average investor's reaction” to the latest breaking news as the impetus for large market moves. Instead, we must consider Wall Street and the Fed's actions when prices start to decline. Do they focus on facilitating exchanges between buyers and sellers, or has their focus shifted to engineering US equity market bottoms when critical price levels are met? Far from an academic discussion, this issue strikes at the very heart of confidence in our markets, which was born out of the “freedom” that has been associated with capital markets for generations. With various sources continuing to use phrases like “worst in 20 years” or “not seen since the Great Depression” to describe the markets, we should be asking, “When they are at or nearing bottoms, do our equity markets demonstrate what looks like naturally occurring or contrived market action? More specifically, do the billions of dollars worth of loans made to certain economic players have an effect on the markets? If the public received such generous funding on such generous terms, how would this affect market dynamics? Point number one on the main chart at the beginning of this article shows us that a bottom occurred on August 16 th , 2007, the day prior to equity options expiration Friday. As we can see in the next two charts, banking and brokerage stocks went up sharply during these two days. So, let's look at what happened. On August 16th , at an unscheduled meeting, the Federal Open Market Committee (FOMC) – a group of bankers paid by bankers to “assist” bankers in their time of need – decided that it was necessary to immediately cut rates. 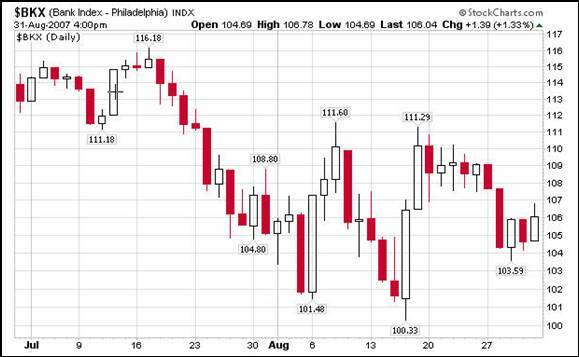 Now, after watching rates go up since the summer of 2004, and housing turn south in late 2005, why did the Fed, all of the sudden, decide that it needed an “emergency rate cut” on August 16 th ? Was it coincidental that the emergency rate cuts occurred after the Dow had been falling sharply and the day prior to option's expiration Friday, on the 17th ? More specifically, if stocks continued to stay at, or fall lower than, their opening prices on the 16th , would Wall Street be on the hook for billions in losses due to put contracts – a leveraged short selling tool? Of course not; this was just a “random, fat tail” event that no one could have foreseen. 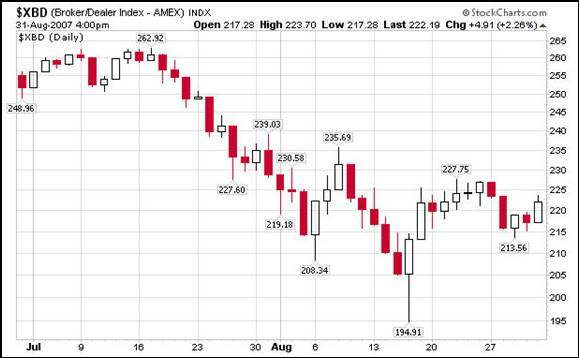 If banks and brokers were taking substantial losses during the five days prior to August 16th , 2007, were there any clues that they were about to begin a sharp rebound? Was the psychological impact of the Fed lowering the discount rate the sole reason that these two sectors of the market exploded to the upside? Or, was there something else added to the punch bowl ? The numbers below suggest that it was more than just optimism that started the markets moving skyward again. Contrast the Fed's total loans to the banking community for the week ending August 15 th – one day before the August 16 th bounce – with the Fed's total loans reported just seven days later, on August 22 nd . Would a one-week 8 fold increase in short term loans provide an incentive to equity market speculators? 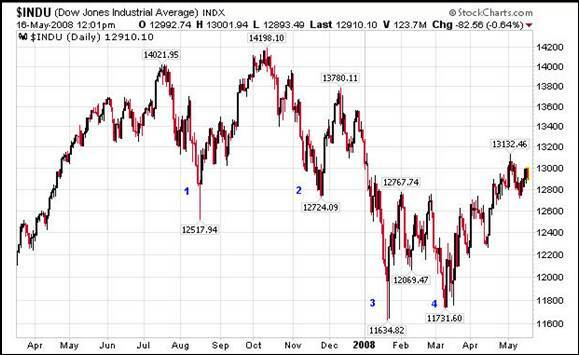 Again, on November 27 th , 2007, the Dow reached another considerable bottom. Again, the four-week decline in banking and brokerage stocks leading into options expiration week suggests that the markets were under sustained pressure. Someone had to come up with another game plan. Evidently, some operational changes would be necessary before we arrived at the December 16 th option expiration week. As we came out of Thanksgiving week, help was already on the way. The markets started to rally. During the week of December 5 th , the Fed increased its “other loans” lending by almost 40 times , from $54 million to $2 billion. And since that would not be enough, on December 12 th , 2008, the Feds announced the creation of the Treasury Auction Facility , which allowed for an additional twenty-four-fold increase from its December 5 th lending – to $48 billion. Again, this was 24-fold increase on top of the 40-fold increase from November 28 th to December 5 th . 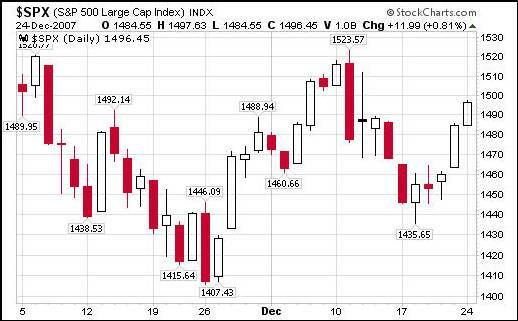 If we move to the next market bottom on January 23 rd , we are likely to notice more of the same. As prices in the equity markets finally began to parallel those of the real estate and debt markets, the month of January was not starting out well. The Monday after the January 18 th 2008, options expiration week, markets around the world took a bath. How would the central financial market planners convince the investing public that all was well? As we headed into the February and March options expirations , how could mission control convince the public that bear market could be, or had been, avoided? How could they get market prices, and especially their own stock, to explode higher? Those who seek to explain the Dow's 4 major bottoms, occurring over the last 7 months, without taking the specific, foundational, operational changes that have occurred across the same span into account, do so to their own and other's detriment. Copyright © 2005-2008 Best Minds Inc.